According to our recent high-speed rail research*, The Rail Journey to 2020, by 2020, long-distance passenger traffic will reach over 1.36 billion, 238 million up vs 2011's figures. We bring you 6 factors that will shape the evolution of today's rail passenger. The 2011-2020 period, which our rail industry report is based, will represent a lot of changes for today's European passenger rail industry. Mostly because of a factors' combination: some relating to structural change, others arising from opportunities created by infrastructural investments and rail technology. 4 key markets are driving anticipated growth in passenger volume over the period 2011-2020: the United Kingdom, France, Switzerland and Germany. The high-speed rail research also outlines a scenario, built around these trends, to size the business potential for passenger rail in 2020. If you want to know how passenger rail operators can take advantage of the trends transforming the industry landscape and benefit from opportunities that currently lie beyond their borders take a look at our report now! Would you like to know more about the future of European high-speed rail? 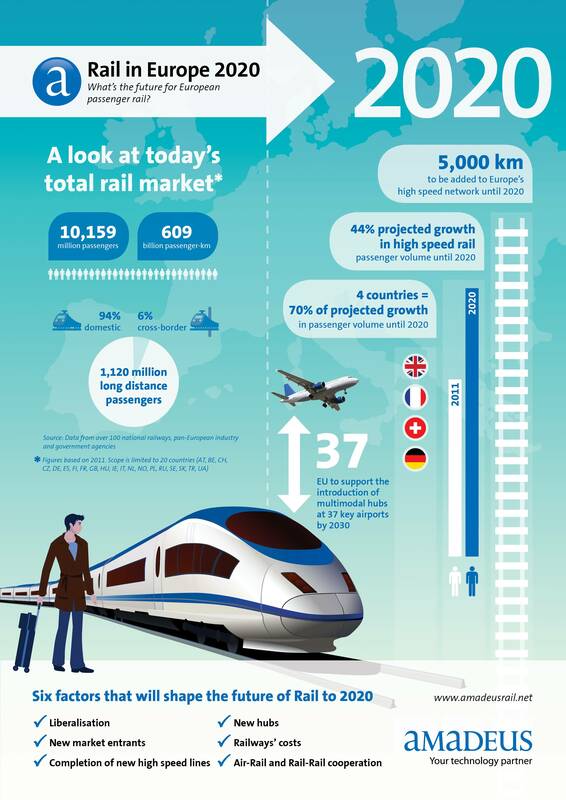 Check out our infographic or download now The Rail Journey to 2020. *Study's results based on authoritative data and best practice modelling techniques. Over 100 railways, public and regulatory bodies were consulted. Amadeus built predictive models based on correlations between long distance rail share of total traffic, national population densities, rail densities, rail industry structure across countries and geography.